The Berlin Half Day Highlights and Hidden Sites tours depart 4 times a day from April to October, departing at 10.00, 10.30, 13.30, and 14.00. From November to March only morning tours are available. Morning tours operate all year and afternoon tour operate only during the summer. We are comparing Berlin Highlights and Hidden Sites Historical Tour Prices from leading ticket suppliers and Try to find you Cheap tickets prices on the market. On the Berlin Half Day Highlights and Hidden Sight tour you will have the unique opportunity to journey from Medieval Germany to the Kingdom of Prussia, continue to the creation of the German Empire, then delve into the murky waters of the Second World War. Follow the difficult path into the Cold War and Communist Germany, before finally breaking down the Belin Wall, finishing your 4-hour experience in 21st century Berlin. With the company of a professional and friendly local guide you'll hear the facts and stories of the city, feel free to ask any questions and pick up some tips on how to enjoy your stay in the Berlin. During to tour your will pass some of Berlin's most famous attractions and sights, including Checkpoint Charlie, the Berlin Wall, Hitler's Bunker, where the Nazi Leader allegedly took his own life, and stop to ponder the Haulocaust and Book Burning Memorials. You'll also walk beneath the majestic Brandenburg Gate, visit the Reichstag in the New Government Quarter and explore East-West City divide. This tour is ideal for history and culture lovers. You'll get to see how the city has developed since the fall of communism and the Berlin Wall. This is an informative tour with covers both modern Berlin and darker aspects of the city's past, recommended for adults or children aged over 12. Your Experience With Berlin Highlights and Hidden Sites Historical Tour? 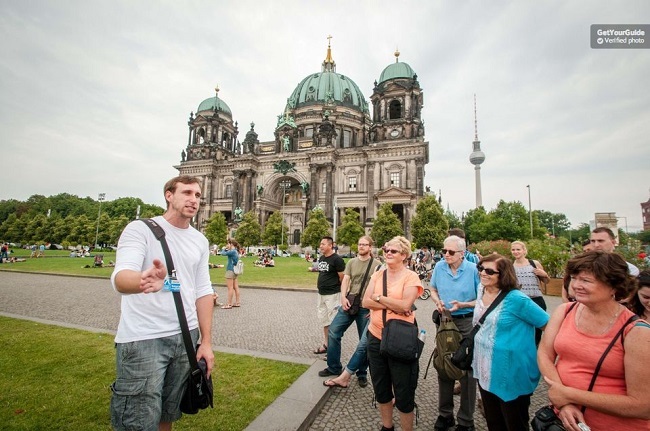 Take a comprehensive tour of Berlin's city centre, with an expert local guide and small group. Travel from East to West visiting significant landmarks in the history of the city, including Checkpoint Charlie, the Berlin Wall Monument, Hitler's Bunker, The Reichstag, and the Brandenburg Gate. Delve into the city's hidden historic sites and hear the stories of World War II and the negotiations made during the Cold War. Get a taste of both historic and modern Berlin, with visits to pre-20th-century buildings, WWII memorials, and 21st-century neighbourhood. What Berlin Highlights and Hidden Sites Historical Tour Includes? 4 hour guided walking tour. Free city map and guidebooket with tips and information on city attractions, eateries, and public transport. Travelers Reviews about Berlin Highlights and Hidden Sites Historical Tour? This city walking tour has 5-star feedback on both TripAdvisor and Viator and a total of over 2,000 reviews. Likewise, this is a 4.9 out of 5-star tour on Get Your Guide's website. Comments agree that the tour is well worth the money. Travellers say that it is a great way to learn about the city. Tour guides have received high praise from tour participants. This tour is wheelchair accessible, however wheelchair users should be accompanied by an assistant. This is not suitable for non-wheelchair users who have difficulties walking for extended periods. Show your guide you printed or mobile ticket. Tickets are refundable however Get Your Guide require at least 24 hours cancellation notice in order to receive a full refund. Tickets purchased from Viator will need to be cancelled at least 72 hours in advance for a 50% refund and 7 days in advance for a full refund. Please wear comfortable walking shoes and appropriate clothing for the weather, the Berlin Highlights and Hidden Sites Tour will operate in rain and shine. All tours are conducted in English. This tour is available in German on Fridays at 10.30. Infront of Weihenstephaner Restaurant, Hachescher Markt Train Station, East Berlin, for the 10.30 and 14.00 tours. Infron od the Zoologischer Garten Train Station, West Berlin, from the 10.00 and 13.30 tours.